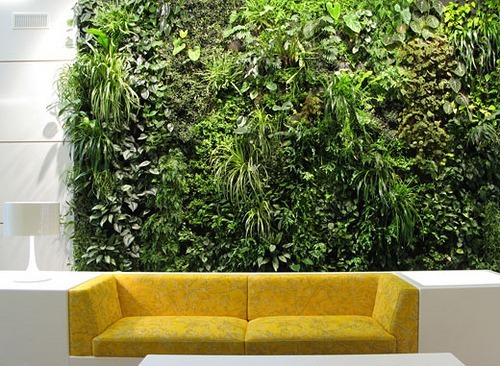 Vertical gardens (otherwise known as living walls) are all the rage right now. We’ve already discussed ways to grow vertical gardens outdoors, so let’s see what you can do inside the home to improve both visual interest and health. In order to insure the success of an indoor vertical garden sunlight is a major consideration. Does light hit one part of the wall more than the rest? And, will the plants grow upward or drape downward? How big do I want the wall do be? There’s a lot to think about, but it’s well worth the effort and a great DIY project, though there are plenty of companies in Southern California that can help with advanced design. 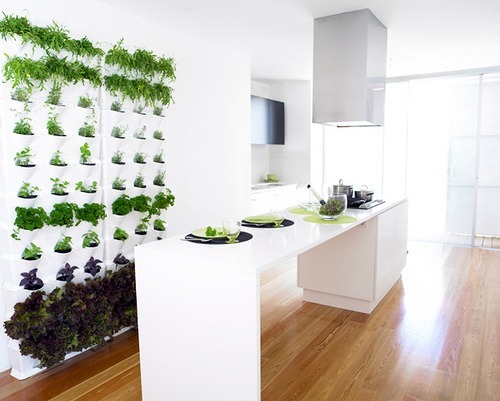 Using an otherwise empty kitchen wall to grow an indoor vertical herb garden is a gorgeous and practical way to use the space. Not to mention that herbs can be extremely expensive to buy when you just need a smidgen for a recipe. Herbs for low light: For walls with little sunlight, a handful of herbs will grow well. Try mint, though keep in mind that it can be invasive if not managed. Another option is chives, one of the easiest herbs to grow inside. Parsley can also grow in shade but keep in mind that it will grow a bit slowly in these conditions. Herbs for sunlight: Herbs that need at least 6-8 hours of sunlight per day include oregano and thyme. Rosemary, particularly the Tuscan Blue type, is great for living walls as it can creep and grow upright. Basil can be difficult to grow indoors, but near a window in San Diego is probably OK. 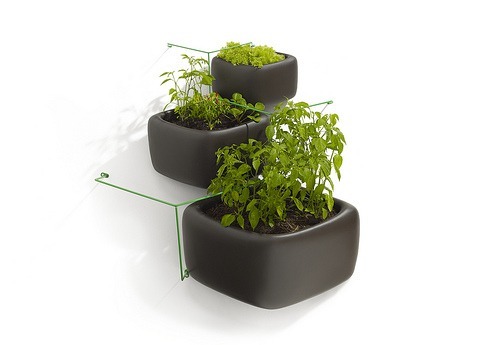 Believe it or not, there are plenty of vegetables that can actually be grown indoors in a vertical garden. Keep in mind the practicalities of your system. For instance, potatoes are typically not a great idea because of weight while carrots might be out due to length restrictions. Lettuce is both ornamental and popular. Even mushrooms can be an option if you have a wall inside a dark closet. There are some pretty major benefits to vegetable vertical gardens. The risk of infiltration by soil-borne pests is extremely low. Rabbits won’t dine on them, less water is used and there’s much less weeding involved. 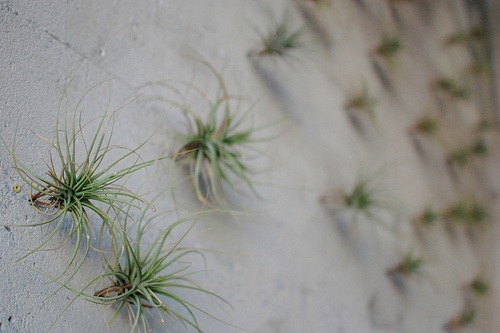 Those who fear over-watering plants definitely need Tillandsia, otherwise known as air plants, who get nutrients through their leaves and only use roots to attach to surfaces like rocks, trees and walls. They are perfect on their own for architectural interest or for plugging holes in vertical walls. Better yet, they thrive on neglect. Air plants need proper air circulation and occasional misting as, again, they take in nutrients through leaves. Make sure they aren’t exposed to direct sunlight. There are over 500 Tillandsia to choose from with a variety of leaf colors and even flowers. Orchids can be grown vertically indoors but do require a little bit of TLC. After all, they’ve been growing this way in the wild for years and years. You’ve probably seen them in places like Singapore and in major orchid shows. 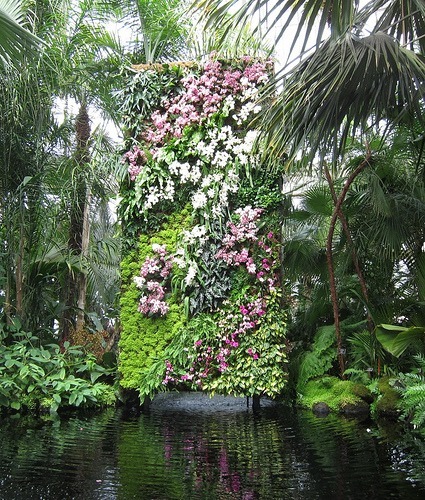 A French botanist by the name of Patrick Blanc has popularized this method over the last few decades by building stunning walls of orchids mixed with other tropical plants. Many homeowners and garden enthusiasts choose plants that are both beautiful and clean the air. Model Summer Rayne Oakes recently installed a 5’x8′ indoor vertical garden using a variety of plants in a system created by Mingo, a company that specializes in residential living walls. This well-done video demonstrates how they did it. Pothos: An evergreen vine with showy, big leaves, pothos cleans the toxins mentioned above and can climb upward or grown downward. Consider it for low light situations. Peace lilies: With large, long leaves and a signature white flowers, peace lilies add visual interest to vertical walls when they bloom while filtering air. Dracaena: They come in a variety of leaf colors that have a tropical look while some even flower. Some dracaena clean air better than others, but they can definitely liven up a wall. Philodrendrons: A gorgeous and very popular house plant, philodendrons are excellent at cleaning formaldehyde from the air, which is a by-product of building materials and even adhesives. The sky is the limit when it comes to indoor vertical garden containers. The above garden is considered vertical simply because its installed on a wall. By far, the most popular DIY indoor system is called a Woolly Pocket which can be modified based on the size of your walls. Here is an in-depth video demonstrating how easy it is to install a Woolly Pocket in a number of situations. Let’s recap what we’ve covered already and mention a few other benefits. — Indoor vertical gardens are a fantastic way to maximize unused space by growing herbs and vegetables indoors, especially if your garden space is limited, which helps reduce grocery bills and carbon footprint. — Plants help remove a variety of common household toxins in the air, which could be especially important with allergy suffers in the house. — Another added benefit, depending on the size of your wall, is that a vertical wall can help insulate the home. Have an exposed space against an exterior wall that let’s in the cold? A vertical wall can help shield against cold and reduce energy bills. — The insulation aspect mentioned above also applies to noise. A vertical wall can help soften the impact of traffic or noisy neighbors. — Studies have shown that gardens can have an instant calming effect, so vertical walls can add much needed zen into your home life. — They are aesthetically-pleasing while perhaps less expensive than the modern art piece you had your eye on in that pricey gallery. Do you have a vertical garden or are you considering one?